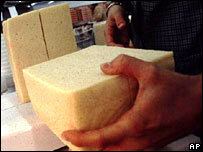 Dairy Crest is selling its own-brand cheese business for £61.9m to a milk company owned by farmers. First Milk, which represents more than 3,000 farmers responsible for 16% of UK milk production, is buying the business that primarily supplies supermarkets. It said the deal would give farmers more direct control over their relationship with supermarkets. Dairy Crest will continue to own branded cheese including Cathedral City - the UK's best seller. First Milk will acquire factories in Cumbria, Wrexham and Pembrokeshire. The businesses being bought made an estimated operating profit of £3.4m on sales of £194.2m in the year ending 31 March. "For dairy farmers to obtain the best possible price for their milk, farmer-owned businesses like First Milk must expand to achieve a critical mass along the dairy supply chain," said First Milk chief executive, Peter Humphreys. "Over the past eighteen months, we have concentrated on the steps required to move away from being predominantly a milk brokerage operation, to create a dynamic vertically integrated dairy business," he added. "With this acquisition, First Milk will make significant progress towards this goal."